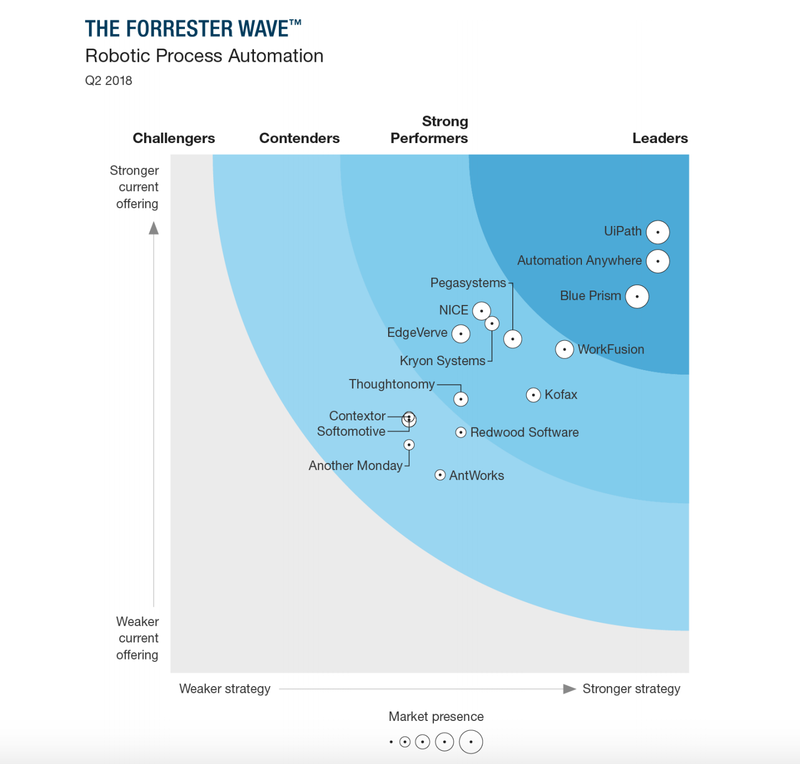 Forrester researched, analyzed, and scored the 15 most significant RPA vendors against a set of 30 criteria grouped by three categories: Current Offering, Strategy and Market Presence. UiPath was top-ranked in the “Current Offering” category, achieved the highest possible score in “Market Presence” and received among the highest scores in the “Strategy” category. We also scored highest in robot development and core functions, architecture, and system management and reporting. The appeal of our technology to an ever-increasing customer base has been overwhelming in 2017, undoubtedly a breakthrough year for high-caliber, large-scale RPA deployments. Achieving the highest possible score in the criteria of ‘execution on enterprise RPA strategy’ and ‘enterprise customers’ validates our efforts so far in making UiPath a true enterprise RPA platform: powerfully scalable, secure and fast-to-results. However, it is the determination and success of our customers that ultimately reinforce this achievement, reflecting UiPath’s leading position in the evaluation. As the market evolves, selective pressures from enterprises drive the development of RPA features. Some have already become standard among most vendors: application control, optical character recognition (OCR), and central management. According to the report’s findings, the current “must haves” are analytics, deployment efficiency, scale, and governance. The platform easily handles attended robots, developed by employees, as well as unattended robots, which can handle large scale processing. (...) Multi-tenancy is a strength that other platforms don’t provide as easily. UiPath helps share platform components across departments and separate data and access to meet GDPR requirements. Reference customers noted its deployment efficiency. Another highlight of this year will be Artificial Intelligence (AI) investment. While enterprise leaders attempt to decipher the hyperbole surrounding AI, RPA vendors are working on enhancing their offers with AI functionality that can solve the critical aspects of end-to-end automation. As the report shows, vendor AI roadmaps differ. Some mostly depend on their own AI algorithms, while others link to partner solutions. Because the UiPath platform is highly extensibile, we own the luxury of capturing the best of both worlds: we develop our own as well as partner with AI functionality. UiPath has 15 partners with natural language processing (NLP), intelligent optical character reader (Intelligent OCR), machine learning (ML), and chatbots directly integrated with Orchestrator, the central control point. The AI algorithms that we are currently working on are meant to perfect the Robot’s vision so it can easily interpret changes in applications and adjust itself instantly. 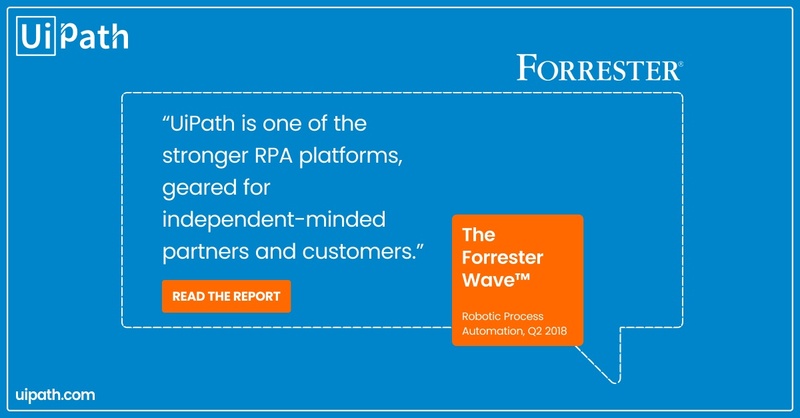 Forrester analysts identify this capability as one of the current must-haves because it significantly reduces RPA maintenance costs and potentially averts the dilution of ROI. It is one of the reasons why we achieved the highest score in the criteria of robot development and core functions. “Enterprises have rewarded UiPath’s open approach”, notes Forrester. Yes! We are overjoyed to see our open strategy bear fruit. UiPath plays nice with others, is not rigid and is not arcane. We believe this to be a major point of differentiation. Because features matter, but an open platform is essential. Why? RPA is only a part of a customer’s overall digital transformation, and the modern knowledge worker will rely on dozens of different technologies to support their daily work (a number that is only going to expand). We built UiPath to be modular and inclusive by allowing plug-ins and extensions, so that as enterprise technologies, requirements and trends evolve, customers can customize our platform and graft their vision onto it. While we are genuinely honored to be recognized as an RPA leader, we also feel galvanized to step up our game and work harder than ever to perfect the product and manage our growth in a way that makes sense for our customers’ future plans. By nature, humans are not very good at predicting the future. This is where being open and flexible helps to mold things into the right form as we evolve.